Your dog may be small, but that doesn't mean he should ride in your lap. If you and Rex are ready to hit the road, whether for a quick trip to the park or a longer trip, you have to think about how he'll ride with you. Your pup's likely a great traveling companion, but it's wise to keep his free-roaming ways limited in the car. Is It Against the Law for My Dog to Ride on My Lap? There is no federal law that requires owners to harness their dogs, but that doesn't make it legal everywhere. Requirements for traveling with Rex can vary according to the state you're in. 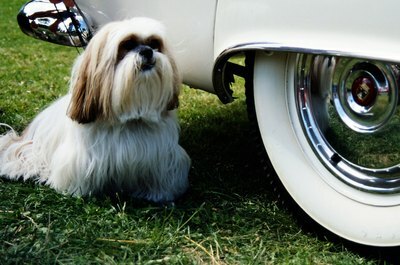 For example, Hawaii clearly forbids people from driving with a dog in their laps. New Jersey police can cite a driver if they find that an animal is being "improperly transported." Other states, such as California and Massachusetts, have laws restricting dogs unsecured in open pickup trucks. If Rex is Allowed to Ride as My Co-Pilot, Why Shouldn't He? Just because it's not illegal for your friend to ride along beside you (or free in the back of your truck), doesn't mean it's a good idea. Riding unharnessed in the car can put your dog at risk. If you are forced to stop quickly, your dog can be thrown into the windshield, on to the floor, or even out of the car. He faces the same risks as any passenger not wearing a seat belt. As well, a dog who rides with his head sticking out of the window is prone to eye injury from flying objects (gravel, dust, and so forth). Finally, a loose dog in the car can be a distraction to the driver. People often pet their dogs while driving, among other things, and even a moment of distraction can have disastrous consequences. How Should I Travel With My Dog? There are several choices for traveling with your dog. If you are keeping Rex in the bed of your pickup truck he should at least be cross tethered into the bed. Dogs who are merely tied in the back can leap out and hang themselves if they are not tethered properly. Another option is to use a crate and strap the kennel to the truck bed to keep it from rolling around. A crate also will work inside a station wagon or an SUV. If your car is not big enough for such a setup, go online or to a pet store and look for a harness that you can use to strap your dog to the seat. Dog car seats also are available. These will work with the seat belt and keep Rex secure for the trip. However you decide to travel with your dog, it's a good idea to make sure he gets some exercise before he's constrained in the car. Allowing him to burn a bit of energy with a good walk or game of fetch will help him settle down for the trip. When you get to your destination, think about what you'll do with Rex if he can't always be with you. Leaving a dog unattended in a car can be risky, particularly in warm weather. On an 80 degree day, the inside of a car can reach 100 degrees in 10 minutes (even with the windows cracked), which can be deadly for a dog. 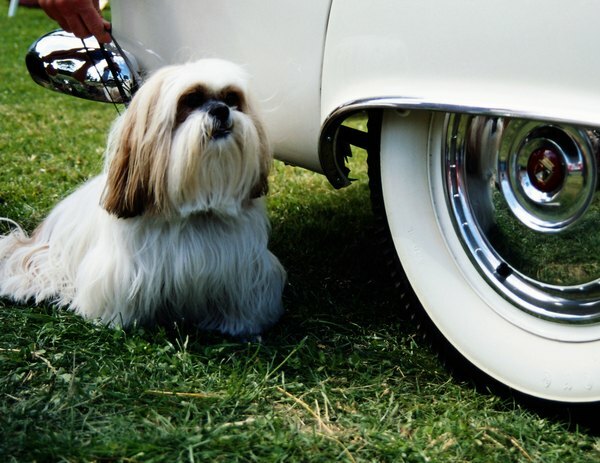 Unsurprisingly, in some places, it is illegal to leave an animal unattended in the car. The best thing is to be prepared. In addition to ensuring your dog has the right gear for his trip, do your homework before you go. If your state has confinement laws, know what they are and plan for them. However, it's always safest to assume that your state requires Rex to wear his seat belt, just like you do.